A review of Philips Sonicare DiamondClean by model, features and benefits. If you’ve never used a sonic electric toothbrush before and want the very best, then the Philips Sonicare DiamondClean rechargeable sonic toothbrush should be among your first options. This top-of-the-line model from the Philips Sonicare stable combines technology with design aesthetics into an attractive oral hygiene solution that’s also economical and great value for money. Now, that last point may come as a surprise if you’ve seen other Philips Sonicare DiamondClean review websites… because many seem shocked at how high the retail price is. But don’t let the sticker price scare you away. You can buy the Philips Sonicare DiamondClean electric toothbrush online for a considerably lesser rate (I’ll show you how later on in this review). Let’s look at the features and benefits of a DiamondClean toothbrush first. My favorite is Amethyst, a rich purple shade with a metallic sheen. I hear that the choice of this new color scheme was inspired by “deep space” – and there is a hint of the “unexpected and daring” in its aesthetic appeal. As you may expect, the design of such a high-end model is sophisticated, yet simple and elegant. No longer is the universe of toothbrushes limited to a white stick capped with bristles! The Philips Sonicare DiamondClean range brings a bit of fashion and style to the staid, conventional world of dental care and oral hygiene. 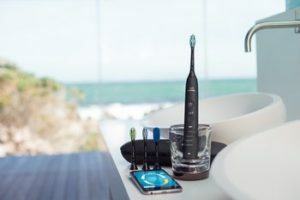 The Sonicare Diamond Clean model runs on a lithium polymer battery which the company claims will run for up to 3 weeks following a complete charge. The battery is rechargeable using a charger that is included in the package. The procedure is simple. Just slide the base of your electric toothbrush on to the glass base of the charger (or plug it into the USB charging case, while on travel). Switching between modes is easy using a button near the base. In Clean mode, the toothbrush head delivers 31,000 strokes per minute. This is extremely effective at cleaning your teeth and also has the secondary “power wave” effect of cleaning at a distance. It helps remove plaque and stains from areas not easy to reach directly with your brush head. Typically, it is recommended that you brush for two minutes twice daily. In White mode, you can set a timer for two and a half minutes for better teeth whitening. The Polish mode is designed to help remove stains and achieve better cleaning, and is a more intense brushing action. Gum Care mode is gentler and can be used by people with gum disease, bleeding, gingivitis and more. Sensitive mode is very weak, and is a good way to begin if you’ve never used a sonic toothbrush before. As you get used to it, you can tweak your Philips Sonicare DiamondClean settings to more powerful modes. The innovation that sets apart the Philips Sonicare DiamondClean electric toothbrush from older models like FlexCare and EasyClean is the design of its brush heads. Bristles in the new toothbrush model are shaped like a diamond, which gives the product line its name. The bristles are high density, arranged at angles that extends your reach and helps remove troublesome stains and dental plaque. The density of bristles is also higher than in earlier models, which gives a more intense cleansing effect. 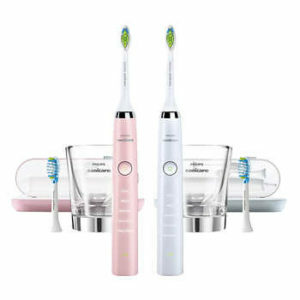 The Philips Sonicare DiamondClean brush heads come in two sizes – regular and compact. Both are effective at generating fluid currents in your mouth which helps cleaning at a distance (‘non-contact brushing ‘). It is recommended that you change brush heads after 3 months of regular use. Replacement brush heads are available for purchase, and they snap-on easily to your toothbrush. What’s NOT to Like About Philips Sonicare DiamondClean Toothbrushes? Well, if there’s any criticism, it’s that the process of shifting modes is quite cumbersome. For instance, to use the electric toothbrush in Sensitive mode, you must press the button five times. Now, this in itself wouldn’t be a major hassle – except that the toothbrush starts even while you’re making these adjustments. So unless you already have it inside your mouth, you might end up with toothpaste sprayed all over your face! An uncomfirmed complaint about long term use of Philips Sonicare DiamondClean Rechargeable toothbrushes is that the gums tend to recede. There is no mention of this on the official website and it’s hard to explain it as being the result of an electric toothbrush. But the complaint has been voiced on a few consumer forums. Battery life is another relatively weak point of the Philips Sonicare DiamondClean electric toothbrush. Some of the reported cases have been tracked down to a defective item, so if you notice this early, please return the product for an exchange. Is the Philips Sonicare DiamondClean Worth Upgrading To? That’s a harder question to answer. If you’re already a happy user of the Philips Sonicare Flexcare Platinum or Philips Sonicare 2 Series electric toothbrush, then whether it’s worth an upgrade to the DiamondClean isn’t quite clear. The good news is that, if you choose to do it, your brush heads will all be compatible with the DiamondClean. So you’ll be able to use Adaptive Clean, ProResults Plaque Control, ProResults Gum Health, Sensitive and SimplyClean brush heads with your Philips Sonicare DiamondClean. It’s easy to snap-on a new head. So, Should You Buy a Philips Sonicare DiamondClean Electric Toothbrush? After reading this Philips Sonicare DiamondClean review, I hope you have enough information to make a decision. If you’re looking for a high-end, top quality sonic toothbrush with all sorts of features and a decent battery life, then this is a good choice. At the beginning of the Philips Sonicare DiamondClean review, I mentioned a place where you can find great discounts and deals on electric toothbrushes. It’s the online retail outlet Amazon.com . Periodically, you’ll find models coming on sale at special rates which are a significant discount on the full retail rate. And you can also compare other related models right on their website so that you’ll convince yourself that the one you pick is perfect for your unique needs. Your ultimate goal in choosing a powerful electric toothbrush like the Philips Sonicare DiamondClean Rechargeable toothbrush is to enjoy healthy, shiny, clean teeth. It’s deeply satisfying to hear delightful praise like “your teeth look fabulous” or “what a lovely smile you have“. And it’s amazing that you can achieve this without costly and painful cosmetic surgery! But to make this happen, you need the right combination of a great electric toothbrush, the appropriate cleaning mode, and a good toothpaste – along with the perfect replaceable brush head. For the Sonicare DiamondClean the best brush head from the range of options available is the DiamondWhite whitening brush head that comes in both Compact and Standard models. The DiamondClean brush head is almost magical at how effectively it removes stains to leave your teeth looking whiter in just a week. Since your brush handle is Brush Sync compatible, choosing a Premium White brush head can tap into its reminder functionality as well. Getting the perfect combination of DiamondClean Rechargeable toothbrush and DiamondWhite brush head ensures that you’ll select the best option of programmed pulsations and brush strokes to clean and whiten your teeth efficiently. And when you use a whitening toothpaste like NuSkin’s AP24 or Oral-B whitening toothpastes like 3D White Luxe, you’ll get even better results. If you have any specific questions or comments about the Philips Sonicare DiamondClean electric toothbrush , please feel free to write to me with them. Or you can leave a comment below.